GnuCash 2.4 Small Business Accounting, by Ashok Ramachandran. This is a Beginner's Guide for managing your accounts. Our own developer Christian Stimming has been contributing to this book as a reviewer, and we can wholeheartly recommend the outcome of this fruitful collaboration. Feel free to have a look at this book over at packtpub.com, and, best of all, the publisher has committed to allocate some percentage of the book sales back to the GnuCash project. Have fun with this book! 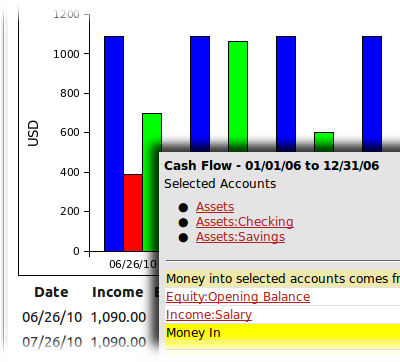 GnuCash is powerful accounting software. Below are details of some of the numerous features that GnuCash has to offer to its users. Every transaction must debit one account and credit others by an equal amount. This ensures the books balance: the difference between income and expenses exactly equals the sum of assets and liabilities. 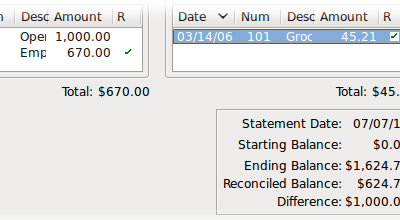 The GnuCash checkbook-style register provides a custom, convenient and familiar interface to entering financial transactions. You can create recurring transactions with a high level of customization of amounts and timeline. You can also set an automatic reminder when a transaction is due. An assistant that runs when GnuCash is started allows scheduled transactions to be postponed without canceling or entering them before the due date. Graphs and reports can be highly and easily customized in appearance and contents, in order to fullfill every user's need. Account reconciliation allows the user to compare the transactions entered in an account against a bank statement. This operation is very useful to spot untracked transactions or data entry errors and ensure that your books match the bank's. The GnuCash reconcile tool with running reconciled and cleared balances makes reconciling against bank statements an easy task. Simplify managing a small business with Customer and Vendor tracking, Jobs, Invoicing and Bill Payment, and Tax and Billing Terms. Using A/Receivable and A/Payable accounts you can even manage payrolls for your employees. 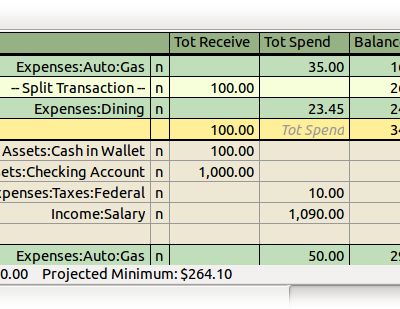 GnuCash gives you also a tool to manage your business' budget so that you can easily plan your financial strategy. GnuCash by default stores data in an xml format. Starting with version 2.4, GnuCash financial data can be stored in a SQL database using SQLite3, MySQL or PostgreSQL. Note this feature is considered experimental. It works for most of the common use cases but some corner cases have been reported to result in data loss. The GnuCash developers fix each issue as it gets reported. There is however no full test coverage so there may still be scenarios left that result in data loss. If you are migrating from other financial software, GnuCash can import Intuit® Quicken® QIF files using a practical assistant. GnuCash is also the first free software application to support the OFX (Open Financial Exchange) protocol that many banks and financial services are starting to use. A transaction matching system ensures that duplicate transactions are accurately recognized and automatically deleted during file import. GnuCash is the first free software application to support the German Home Banking Computer Information protocol, allowing German users to perform statement download and initiate bank transfers and direct debits. GnuCash runs on many different operating systems including Windows, MacOSX and Linux. GnuCash handles internationalized dates and currencies. The application's menus and popups have been translated to 50 languages, including Chinese, Danish, French, German, Hungarian, Italian, Japanese, Norwegian, Polish, Portuguese, Russian, Spanish, Swedish, Turkish, Ukrainian, and British English. Documentation is available in English, French, Portuguese and Spanish. GnuCash is very well documented: along with the application Manual, new users can take full advantage of the Tutorial and Concepts guide. This document gives background information on accounting principles and how they are reflected in GnuCash with many practical examples described step by step.